Miramar Beach, Fla. (August 30, 2017) – Emeril Lagasse’s newest restaurant is now open in Grand Boulevard at Sandestin. Emeril’s Coastal Italian opens daily at 11:30 a.m., seven days a week offering one menu for both lunch and dinner. The menu is Italian and Gulf seafood-inspired, serving a variety of dishes from fresh pastas, flatbread pizzas and house made meatballs to a local fish special of the day, oysters Florentine and skillet Gulf shrimp. To the delight of his customers, Chef Emeril’s famous banana cream pie is featured on the dessert menu. “My team and I have had a lot of fun developing this menu and exploring all the amazing ingredients that the region has to offer. We are thrilled to open our doors and look forward to bringing an experience we can be proud of to our guests. We just try to make people a little happier leaving than when they walked in,” said Lagasse. Gulf Coast born and raised, Shane Quinlan is Chef de Cuisine of Emeril’s Coastal Italian and Ki Song An, a long-time Chef Emeril protégée, is the general manager. “The interior space and design of the restaurant was as much of a priority as the menu itself,” said Lagasse. 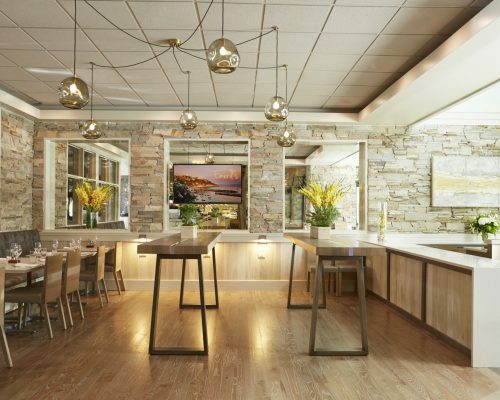 The décor, inspired by Alden Lagasse’s vision for an approachable yet elegant atmosphere, merges Italian and coastal influences. The design team included interior designer Susan Lovelace, ASID from Lovelace Interior, design associates Brooke Williams, and interior design assistant Amber Miller. Also, architects Geoff Chick & Jeff Margaretten. The Lagasses chose Landon Lott of New Orleans to be the featured artist showcasing his larger than life murals as a main focal point. The neutral color palette, furnishings and dramatic lighting create a sophisticated yet casual ambiance that balance the bustling open kitchen and lively rectangular bar and café. The restaurant joins a premier group of 13 restaurants in Grand Boulevard, a popular Northwest Florida Town Center that has become a culinary destination for visitors and the local population. Emeril’s Coastal Italian is located at 435 Grand Boulevard, next door to the Boulevard 10 Cinema. Both indoor and outdoor dining options are available. To learn more about the restaurant or to make reservations, call 850-608-7040 or visit emerilsrestaurants.com. Chef Emeril Lagasse is the chef/proprietor of 14 restaurants in New Orleans, Las Vegas, Orlando, Miramar Beach and Bethlehem, PA. As a national TV personality, he has hosted more than 2,000 shows on the Food Network, and is the food correspondent for ABC’s “Good Morning America.” Most recently, Amazon launched an original series featuring Lagasse called Eat the World with Emeril Lagasse. Lagasse has appeared as a guest judge in four seasons of Bravo’s hit food series, “Top Chef,” was named a co-host on the 10th season of the “Rachael Ray Show,” and has appeared on the Cooking Channel with five seasons of “Emeril’s Florida.” He is the bestselling author of 19 cookbooks, the latest, Essential Emeril: Favorite Recipes and Hard-Won Wisdom from My Life in the Kitchen, released in October 2015. In 2002, Emeril established the Emeril Lagasse Foundation to support children’s educational programs that inspire and mentor young people through the culinary arts, nutrition, healthy eating, and important life skills. To date, the Foundation has donated more than $7 million to community organizations in New Orleans, Las Vegas and on the Gulf Coast. Please visit emerilsrestaurants.com for more info.